Ask servers for the oyster of the day. Served with ponzu, momiji oroshi & green onions. Served by the 1/2 dozen. Fried salmon pieces marinade in a sweet vinegar marinade and vegetables..
Spicy tuna, jalapeño slices & sweet sauce over crispy fried cubes of sushi rice. Thinly sliced yellowtail, jalapeño, chili ginger salsa, yuzu soy sauce & garlic chips. Minced salmon seasoned in wasabi garlic soy sauce. With masago & green onions. Seared Tuna loin slices & cucumber with sweet miso. Mixed greens, tomato, cucumber, and radish served with our house ginger soy dressing. Thin slices of cucumbers pickled in sweet rice vinegar, wakame & sesame seeds. Tuna or Salmon; avocado, cucumbers, seaweed salad, masago, kaiware & sesame in our chili poke dressing. Thin slices of tuna, salmon & hamachi. Garlic olive oil, sea salt, cracked peppercorn & yuzu soy sauce. Assorted slices of fish with our ginger onion dressing over mixed greens, masago & avocado. Pulled chicken, mixed greens, tomatoes, kaiware & cucumbers served with a creamy sesame dressing..
*Consuming Raw or undercooked meat, eggs, fish and shellfish may increase your risk of food borne illness. Boiled soybean pods with kosher salt. 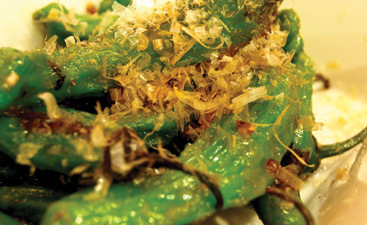 Boiled edamame sautéed with chili bean paste. Pan-seared and tossed in our Yuzu miso sauce. Topped with ito-gaki. Careful, 1 in 10 are spicy! Panko breaded oysters deep fried and served with tonkatsu sauce. Shrimp, Salmon, and scallop with seasonal vegetables. Served with a sweet soy dashi broth..
Fried in a chili batter & served with spicy mayo. Sautéed scallops & white mushrooms baked in spicy mayo & parmesan cheese. With masago & green onions. Cream cheese, spicy salmon, tempura fried. Topped with spicy mayo, sweet sauce, green onions & masago. 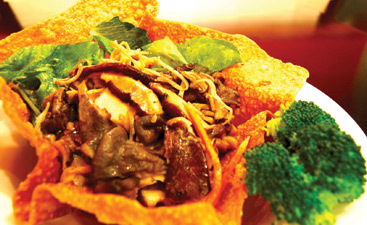 Fried and served in a sweet soy dashi broth. With green onions, daikon, and ito-gaki. Manila clams in miso soup and wakame. Thick wheat noodles in a clear soy broth. Manila clams, wakame, shiitake & spinach. Thick wheat noodles in a clear soy broth. 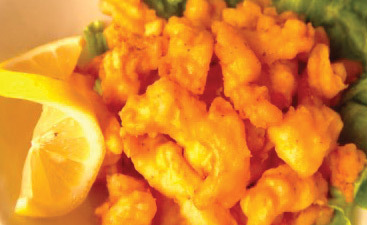 Shrimp & vegetable tempura served on the side. Thick wheat noodles in a clear soy broth. Chicken, vegetables, poached egg & 2 tempura shrimp. Charbroiled & served with teriyaki sauce. Chicken breast panko breaded & deep fried. Served with a Japanese BBQ sauce on the side. Pork loin marinated in our ginger soy sauce & sautéed with onions. Pork loin panko breaded & deep fried. Served with a Japanese BBQ sauce on the side. Salmon fillet seasoned in shichimi & pan fried. With shiso oil & pineapple salsa. Snow crab, mayo, cucumbers & avocado. Snow crab & avocado, tempura fried with sweet sauce and mayo on top. Tuna in spicy sauce & cucumbers. Broiled eel, cucumbers & sweet sauce. Salmon, cream cheese & avocados. Minced yellowtail mixed in spicy sauce & cucumbers. Hokkaido scallops mixed in spicy mayo and masago with cucumbers, radish sprouts & avocado. Fried tofu and avocado with sweet sauce. Tempura vegetables & sweet sauce. 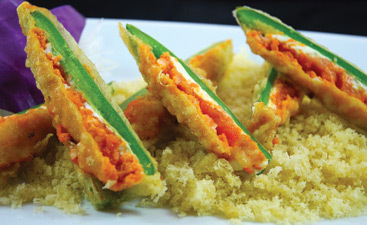 Spicy tuna & tempura green onion. 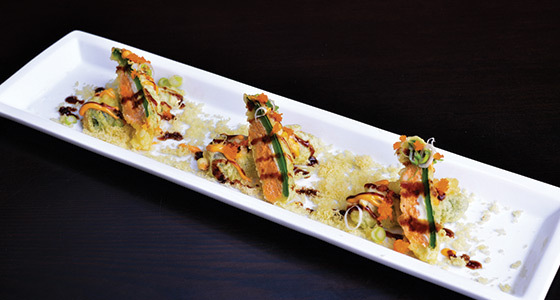 Topped with seared albacore, avocado, garlic chips, 7-spice & creamy sesame dressing. Hamachi, tuna & salmon rolled futomaki style with avocado and masago. Sushi rice, mixed greens, avocado, salmon & snow crab in a cucumber wrap. Creamy sesame dressing. Spicy snow crab, avocado, crunchy bits. Topped with sear salmon, spicy mayo, 7-spice & green onions. Spicy California roll topped with spicy tuna, sweet sauce, mayo & masago. California roll topped with seared salmon, sweet sauce & spicy mayo. California roll topped with 5 slices of assorted fish, shrimp & avocado. Spicy tuna & cucumber topped with broiled eel, avocado & sweet sauce. Spring mix, cucumbers & spicy tuna. 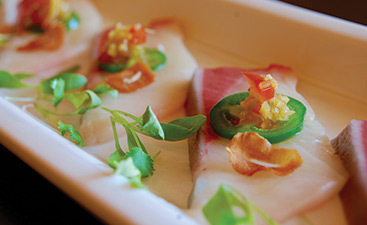 Topped with fresh hamachi, & 7-spice. Snow crab, shrimp, cucumber & spicy mayo rolled in a thin egg crepe. Broiled eel & cucumber topped with avocado slices & sweet sauce. Shrimp tempura & avocado. Topped with seared salmon, sweet sauce & spicy mayo. Shrimp tempura & avocado. Topped with spicy tuna, spicy mayo & masago. Shrimp tempura & avocado. 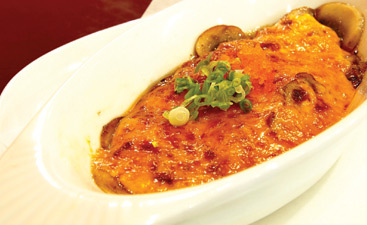 Topped with eel & sweet sauce. Shrimp tempura & avocado, rolled in crispy tempura bits, sweet sauce. Shrimp tempura, snow crab & cucumber. Topped with tuna, avocado, mayo, sweet sauce, & green onions. Fried Soft shell crab, snow crab, cucumber, avocado & masago. With Sweet Sauce. Fried soft shell crab, spicy tuna & jalapeño slices. Topped with avocado slices, spicy mayo & masago. Spicy tuna, snow crab and cucumbers. Topped with fried spicy poppers, avocado, sweet sauce & spicy mayo. Salmon, cream cheese, avocado & tempura fried. With sweet sauce. Spicy tuna & jalapeño tempura fried. Topped with sweet sauce & spicy mayo. Shrimp, cucumbers, avocado & spicy mayo. Topped with Hokkaido scallops, lime slices, truffle oil, cracked pepper. 6 piece nigiri of the Chef’s selection. 10 piece nigiri of the Chef’s selection. 8 piece nigiri of the Chef’s selection with a tuna roll. 8 pieces of the Chef’s freshest selection. 15 Pieces of the Chef’s freshest selection. 25 Pieces of the Chef’s freshest selection. 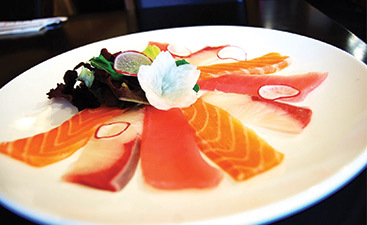 Chef’s selection of fresh Sashimi on top of seasoned sushi rice served in a bowl. Assorted cubed fish over mixed greens, tamago, & lightly dressed in sesame oil, with a spicy chogochujang on the side. Served with steamed rice. Omakase translates to “leave it to you” meaning entrusting our experienced chefs with providing you, a variety of dishes based on availability and seasonality in a multicourse style meal. Pricing is flexible and can be determined by you or as a fixed price. 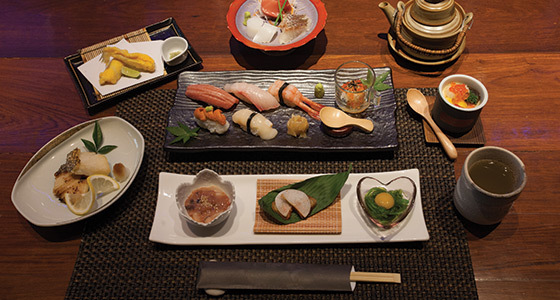 *Recommended for our most adventurous and experienced sushi eaters. Served with steamed rice, mixed green salad with a ginger carrot vinaigrette, and miso soup. Upgrade to Asari Miso 3.